We are going to have a Glee Marathon today.“Put the CD on,"Chris said.“Done," I replied. I was really excited because I&apos;m about to see Klaine again. When I was watching I totally forgot that they are beside me. OMG! We are now on the engagement scene. “Yes!Yes!Yes!Yes!Yes!Yes!Yes!Yes!Yes!" I shouted. I looked back and I saw them laughing at me.“It looks like you really love Klaine," Darren said.“I&apos;m a Klainer forever," I said.“I&apos;m about to say yes,"Chris said. They kissed.... it made me more in love.“That&apos;s what I called LOVE," I said.“Did you ever had a boyfriend before?" Darren asked.“No," I said quickly. “Why? "Chris asked.“Coz I&apos;m really sincere to my six year crush. I&apos;m kinda wishing that he will see that," I replied. “That is some lucky guy. Why can&apos;t he see that? I bet he&apos;s choosy,"Chris said. Darren and I starred at each other and we both laughed. Is he really judging himself? Chris is looking at me and it was weird. I really want to tell him my secret but the problem is I don&apos;t know his after reaction about that awful statement. Is that really awful? “Back to the seat episode 2 is about to start,"Darren said. The episode 2 is starting. “I have a short trivia for you guys. Do you know that I still know all of the episodes in season 5?" I said.“Prove it,"Chris said.“Love Love Love,Tina In The Sky With Diamonds, The Quarterback, A Katy Or A Gaga,The End Of Twerk,Movin&apos; Out,Puppet Master,Previously Unaired Christmas, Frenemies, Trio, City Of Angels,100,New Directions,New New York,Bash,Tested,Opening Night,The Back Up Plan,Old Dogs New Tricks, and The Untitled Rachel Berry Project," I replied. “Now that&apos;s a real Gleek,"Chris said. “Look you got nominated as Prom King," I said.“Why are you acting like you don&apos;t know the story? "Darren asked.“I absolutely know the story but when I&apos;m watching an episode, I act like I don&apos;t know the story but in the end, I realized that I almost memorized your lines in each episode," I said.“You&apos;re truly unbelievable," Chris said.“Excuse me," I said. I went to the bathroom and took a bath. It was really weird. It is my second day in New York. Chris and Darren are now friends or should I say my 2nd family. It was like I&apos;m sleeping in a dream but I&apos;m not. I learned a lot from them especially in falling in love. Should I finally tell Chris about this? Or it will be a hidden secret forever? I don&apos;t want ruin anything maybe I can tell him next year. Never mind... I&apos;ll just forget that for today. I&apos;m finished. Just one thing to do, I&apos;ll cook lunch. I will cook eggs,hotdogs, and bacons. Doesn&apos;t sound like lunch? It is my first lunch in New York and there is no rice at all. But I need to eat without rice. I&apos;m going to miss rice. It is pretty amazing coz today, I can finally cook. I eat secretly without telling them. After eating, I washed the dishes. I left them some food because I know they will never get out in here until KC comes. Then I went to my room and sleep. “What took her so long it&apos;s already episode 4? "Darren asked.“I don&apos;t know maybe I&apos;ll just check on her,"Chris said. Where is she? I found hotdogs,bacons, and eggs in the kitchen but she&apos;s not there. I checked her on her room and she was there. She is sleeping but I sat in her side. I felt like there is someone starring at me. I opened my eyes slightly and it was Chris. I faced around so I can&apos;t see his face. He took my hand and whispered something. “Is there a problem with me? "Chris asked in a whispering way. He thought that I couldn&apos;t hear him but I heard every word.“I didn&apos;t really know why I gave my number to you. I think there is a reason for it. It is still a mystery for me. I think you&apos;re the one who can answer it? I think we are really destine to meet. Do you know the reason? You and Darren are acting weirdly sometimes. Then after that both of looked at me weirdly. Can you tell me the reason? I&apos;m also feeling weird but I can&apos;t tell because you will be uncomfortable with it. Right? When can you tell me your secret? You already told Darren about it but I met you before. When can you tell me about it? When? When? When?" Chris whispered. I sat up. I rubbed my eyes and looked at him.“I&apos;ve heard everything you&apos;ve said," I said.“How? "Chris asked shyly.“Before that lock the door," I said. Chris locked the door and sat at my bed. “I didn&apos;t really sleep. I just listened to you," I said.“Did you heard every word? "Chris asked.“Yes," I replied. “It was embarrassing," Chris said shyly.“I should be the one to be embarrass because I&apos;m a disrespectful person," I said.“Don&apos;t you ever tell that again to yourself! You&apos;re are sweet and you&apos;ve never been a disrespectful person," Chris said.“You can&apos;t blame me for being the most negative person," I said.“I didn&apos;t tell you about my questions because you will have a confusion again. I will blame myself because I&apos;m the reason of your confusion. It is also because you have sensitive feelings about these problems,"Chris said. “Now I&apos;m causing problem to you," I said.“Can you just stop thinking like that? I&apos;m sorry,"Chris said.“You don&apos;t need to apologize. Blame it on me!" I said. Then Chris hugged me.“You can cry as long as you want in my arms. You can tell me everything. Okay? "Chris asked. “Why do some people hate me?" I cried.“Is that true? "Chris asked.“Yes," I replied.“I can&apos;t find a reason for it," Chris said.“Is there a possibility that someone can fall in love with me?" I asked.“Yes but he needs my approval first," Chris said. “I wonder who he is," I said.“I hope that he&apos;s not like your past,"Chris said. I&apos;m feeling a lot better.“Thank you so much. 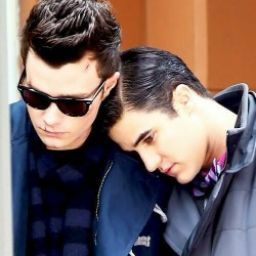 I learned a lot," I said.“I think we should go out and check on Darren,"Chris said. So Chris opened the door and we saw Darren eating. “What took you guys so long?" 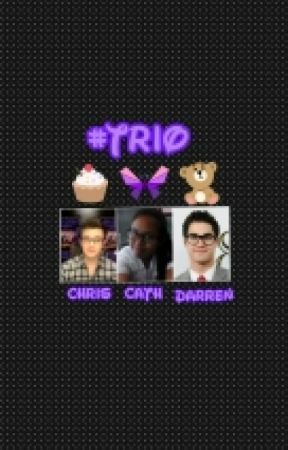 Darren asked.“We just need to talk about something," Chris said.“Don&apos;t be afraid to tell something," I said.“I will,"Chris said. Then Chris joined Darren. I went back in my room and looked at the mirror. I feel different and better. I let them eat and I watch. Movin&apos; Out is about to start. They&apos;re still eating. I love this episode but I want to watch it with them. I don&apos;t want to disturb them. So I decided to sleep. “We should check on her," I said.“You&apos;re right," Chris said. So we checked on her and she was sleeping. “Are you sure she&apos;s sleeping? Coz the last time I checked she&apos;s not,"Chris said.“I think she is," I said.“Should we wake her up? "Chris asked.“Let her sleep. We woke her up 9:00 a.m. and she slept at 1:00 a.m. I think she deserves it," I said.